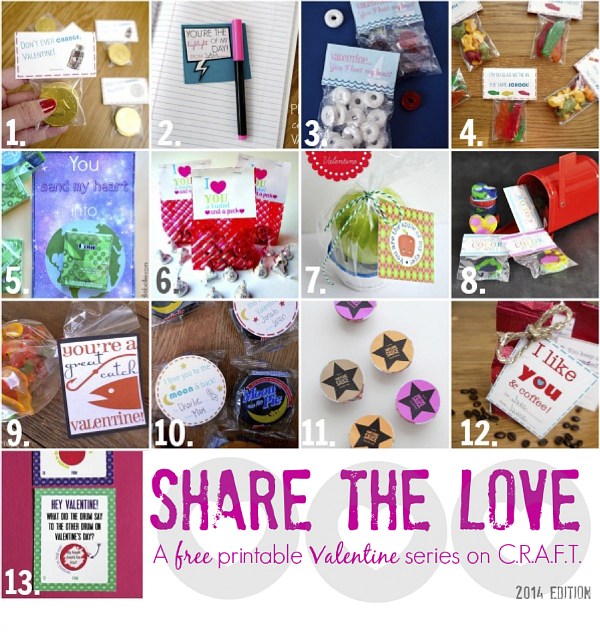 Share the Love 2014: 13 Free printable Valentines day cards - C.R.A.F.T. The heart day countdown is on… only 6 days left until Valentines Day! Haven’t made your heart day cards yet? No worries, get the kiddos to help you this weekend and use one of these 13 free printable Valentines day cards below! 7 of the 13 printables are for non candy love day treats including: highlighters, gold fish, apples, crayons, apple sauce, coffee and joke cards! If you’re looking for more healthy options check out this list of 63 non candy Valentines Day ideas. Oh and here are 100 more clever valentines day sayings paired with small treats! Enjoy! Click on the bolded links to get the free printables! 1. Don’t ever change from C.R.A.F.T. 2. You’re the highlight of my day from C.R.A.F.T. 4. You’re o”fish”ally an awesome friend from C.R.A.F.T. 10. I love you to the moon and back from C.R.A.F.T. 12. Thank you for keeping me grounded from C.R.A.F.T. PS: Here are 8 more free, printable Valentine cards from last years Share the Love series!